It is possible to set up your Galera Cluster as an aggregator of your masters in a multi-source replication setup, we’ll walk you through the steps in this blog. Note that the howto is for Galera Cluster for MySQL (Codership) and Percona XtraDB Cluster. In a separate post, we’ll show you how to configure MariaDB Cluster 10 instead. 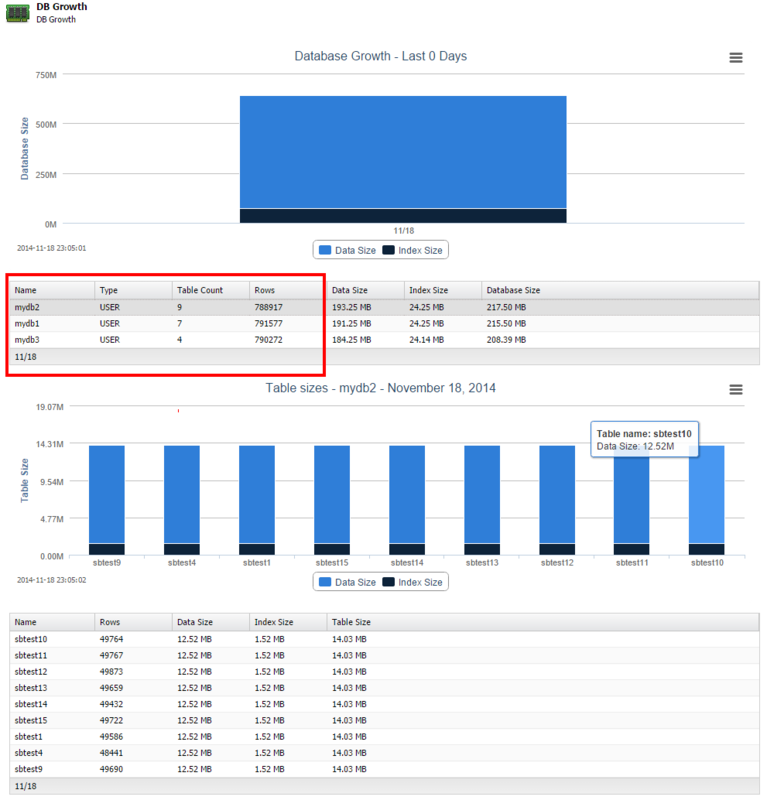 If you would like to use MySQL Cluster (NDB) as aggregator, then check out this blog. Galera cluster can operate both as MySQL master and slave. Each Galera node can act as a slave channel accepting replication from a master. The number of slave channels should be equal or less to the number of Galera master nodes in the cluster. 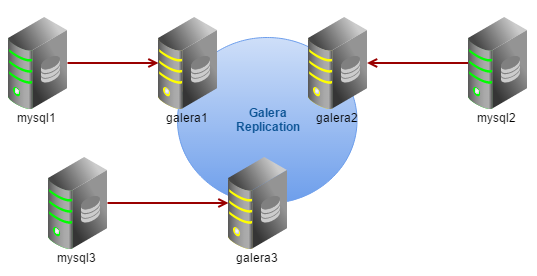 So, if you have a three-node Galera cluster, you can have up to three different replication sources connected to it. Note that in MariaDB Galera Cluster 10, you can configure as many sources as you want since each node supports multi-source replication. To achieve multi-source replication in MySQL 5.6, you cannot have GTID enabled for Galera Cluster. GTID will cause our Galera cluster to work as a single unit (imagine one single slave server), since it globally preserves the MySQL GTID events on the cluster. So the cluster will not be able to replicate from more than one master. Hence, we will use the “legacy” way to determine the starting binary log file and position. 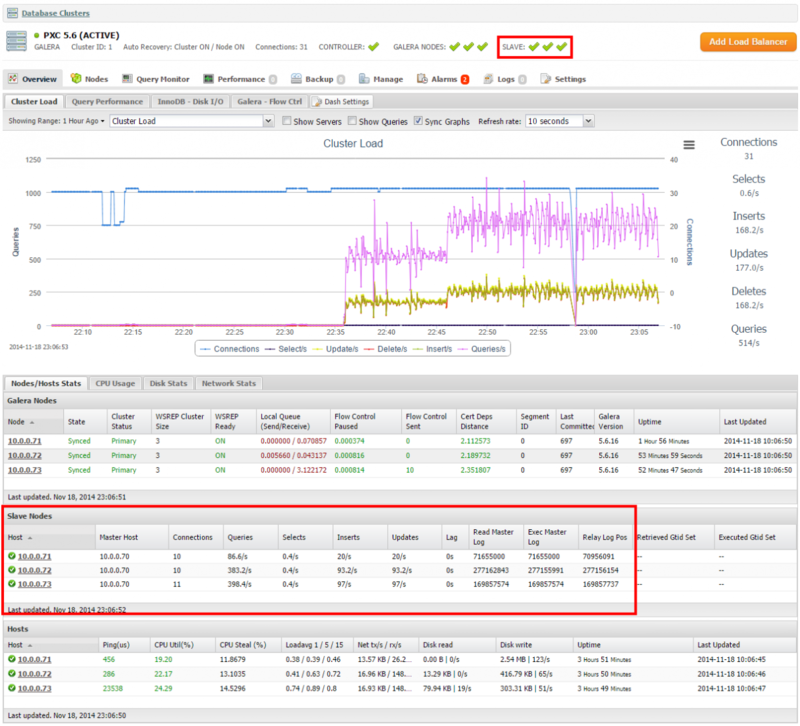 On a side note, enabling GTID is highly recommended if your Galera Cluster acts as a MySQL master, as described in this blog post. We have 3 standalone MySQL servers (masters), and each master has a separate database: mydb1, mydb2 and mydb3. We would like to consolidate all 3 databases into our Galera cluster. The asynchronous replication slave thread is stopped when a node tries to apply replication events and it is in a non-primary state. It remains stopped after successfully re-joining the cluster as default. It is recommended to configure wsrep_restart_slave=1 which enables the MySQL slave to be restarted automatically when the node rejoins the cluster. ** Above steps should be performed on each of the Galera node so that each slave can position correctly in the binary log as written in the dump file. At this point, our Galera cluster has starting to accept replication events from three different sources. Since MySQL replication is single threaded, Galera node will apply replication events as fast as native MySQL slave. As a workaround, you can configure wsrep_mysql_replication_bundle=n, to group n MySQL replication transactions in one large transaction. MySQL replication events are treated as regular MySQL clients, they must go through Galera replication pipeline at commit time. This adds some delay before commit.